A few smart occultists of my acquaintance have been blogging lately about “transcendence.” I'd like to offer a metaphor that I picked up several years ago from Tom Graves' charming little book Inventing Reality: Toward a Magical Technology . If you like, you can go right to the source and read Graves' own description of this metaphor. (Linkrotted, so you'll find it at the foot of this piece.) I have my own version, with some extra embellishments I think are relevant. Imagine the world of human experience as a swamp. The swamp has a varied terrain: sandbars, reedy marshy bits, outcroppings of land, shallow rivers, muddy riverbanks, and so forth. Full of interesting stuff, but not entirely hospitable. Living in a castle is usually safe and comfortable ... except that castles have a tendency to sink into the swamp. A castle may gradually lose a level at a time, sometimes so slowly that its residents do not realize it is happening. If the residents keep working at building the castle, they can stay ahead of the sinking ... at least for a time, since a castle will tend to sink faster as it gets heavier. Occasionally, a castle may sink suddenly because of a flaw in the foundations. On rare occasion, entire castles full of people can vanish without survivors when the castles had no windows, or when no one bothered to look out of what windows there were. A few very independent people travel around the swamp in one of those swamp boats with the big fans. They get to see a lot of the swamp, though they don't get a close look at much as it whizzes past them. Many people riding in swamp boats are more interested in the excitement of movement than in seeing the swamp itself. That can be dangerous; the faster you go, the more likely you are to hit a sandbar or other obstacle, and the harder you'll hit it. Wrecking a swamp boat can leave you stranded or dead. OK, you can probably see where this is going. The castles are a metaphor for ideologies, meant in a pretty broad sense. This can mean obvious political ideologies like Bolshevism or fascist nationalism, but it can also refer to the kinds of things that we classically refer to as religions, or to humanist materialism, to conspiracy theory paranoia, to positivist rationalism, and so forth. The sort of folks who read my blog may take that as a knock on ideology castles, but it isn't necessarily. Ideology is an effective solution to the swampiness of human experience. Certainly not everyone is cut out for life on a speedy swamp boat. The swamp boat is a metaphor for people living the artistic life. That means not necessarily artists in the classical sense, but also the iconoclasts and libertines and rebels who drink deep draughts of human experience. They live thrilling lives, and often have amazing tales to tell, but it's a dangerous life, and many of them suffer terrible misadventures sooner or later. There are two other classic ways of living in the swamp. One is to pick a spot in the swamp and just build and build and build on that spot. When these folks succeed, they rest at the top of lofty poles rising into the clear cool air high above the waters of the swamp. Pole sitters may climb a pole that has already been planted in the swamp, and such a pole may have several people at various heights in the process of climbing their way up it. Some poles are easier to climb than others, but climbing any pole is hard work. A few people do the even harder work of constructing new poles. Occasionally people even get grabbed at random by great birds and deposited on poles, much to everyone's surprise. From their vantage point, pole sitters can see the whole of the swamp, and will call down to the people down below, describing what they see. For the most part, the people living down at the surface level have a hard time making sense of what the pole-sitters see. “What's all this about green carpets and silvery ground? The world is made of green reeds and brown mud and gray water!” Most baffling, they have a hard time understanding why one pole sitter planted over here describes something so similar to what a pole sitter describes seeing from way over there. “Aren't those two places completely different?” As a result, pole sitters have a hard time talking to most folks at the surface, though they often have a lovely time calling across to other pole sitters on other poles. The air at the top of the poles is so clear and invigorating and the view of the swamp is so spectacular that pole sitters tend not to climb back down into the muck of the swamp. Occasionally they do, and those folks tend to amaze the other swamp denizens with their ability to navigate the swamp, as a result of having seen it from a high vantage point. And while pole sitting does lift one above the viccitudes of life in the swamp, pole sitting is not without risk. One can slip and fall, and the higher one has climbed, the more dangerous that can be. Occasionally a pole may topple, pitching its sitters into the swamp. Pole sitters are a metaphor for mystics. This is what I think Yezida is talking about when she refers to transcendence. She doesn't want to climb up a pole and be separated from the ordinary human experience of the swamp; she is interested in yet another way of living in the swamp. This last way is to wander through the swamp on foot. Folks who do this carry a bit of lightweight gear to help them handle the challenges of moving through the treacherous ground: poles and swamp boots and bits of rope and so forth. When they run into one another they tend to exchange a little lore about useful tools: “If you make yourself a little platform like this, you can drag some more things with you in the drier patches, have a dry place to sleep in the muddy patches, and use it as a skiff to get across the shallows.” They're constantly picking things up and casting things off, changing their kit to match the changing conditions in the swamp. Most swamp travellers try to keep maps of the swamp, made from the painstaking work of other swamp walkers, or from pole-sitter's descriptions. They generally update and annotate their maps while they wander, and often the first thing two swamp walkers will do when they meet one another is look at each others' maps. Swamp travellers are interested in the swamp, and often are also interested in the different swamp denizens. They may stop in to visit folks in the various castles, carrying news and information around the swamp, picking up supplies, and occasionally deciding to settle down in one for a while, or even forever. They also tend to know the locations of ruined castles where a few eccentric holdouts are living and working. They might hitch a ride on a swamp boat for a while. They also like to stop at the bases of poles to talk to the pole sitters, and many swamp walkers say that it's important for them to take time out to to climb at least partway up one of the poles to get a good look around the swamp, rather than just relying on maps drawn by others. Others figure it's better to build up their own map the hard way, walking around at ground level. When taken as a spiritual path, swamp walking is what I think Yezida is talking about when she cautions against transcendence. She is advocating intimate engagement with the muck of human experience and effectiveness in the material realm, rather than climbing a pole up to a transcendent escape into nirvana. Since Graves' description was on a website which no longer exists, I've resurrected it from archives here. In the last chapter we saw that coincidence and meaning are quite separate — we can't really say that any thing or any co-incidence can be said to be caused by any other event, point of view or whatever. Anything goes. The trouble with that concept is that if anything goes, we are left with nothing with which to make sense of the world. Without some way of handling it, we have no way of predicting anything at all, and everything and nothing happens at the same time — a certain recipe for instant insanity. So we need some kind of model which allows us the flexibility to allow anything to happen, yet still operate in something resembling a controlled manner. This gives us four quadrants, or modes, in which we both collect information and interpret it: inner value, inner truth, outer truth, outer value. Each of these quadrants is only a way of working on the world, a mode to describe reality as we experience it through using that way of interpreting the world. Reality is, if you like, the sum of everything that could be experienced through these four very different ways of working on the world. This kind of model of reality can be found in Jung's work, for example; but there is a particularly interesting variant on the theme in SSOTBME , a bizarre book on ‘thinking about thinking’. The book was published anonymously, so, for convenience, I shall refer to its author as Leo (a simpler name than his fictitious character Lemuel Johnstone). Leo builds this model by describing the whole of reality as a swamp. Not a featureless swamp - every point of view, every experience, every possible coincidence of events is included. There are also endless opportunities to wallow in the mires of confusion, and to disappear beneath the surface without trace... It sometimes seems that the safest move would be not to move at all, to stay still. But even that isn't certain: the surface seems to quake with the tide of events, so that even the safest-seeming point of view will seem doubtful after a while. Nothing stays the same for long: indeed, the only real constant is change itself. As Leo puts it, there are four main ways in which to exist within this kind of reality. 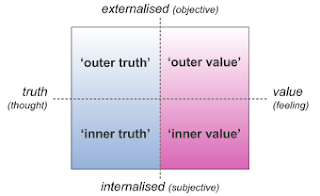 Each one coincides with a quadrant of the model above: inner value, inner truth, outer truth, outer value. Each is best described as a mode of operation, in which certain possibilities — such as movement, in this sense of moving from one point of view or one experience to another — exist solely because others — such as stasis, developing one particular point of view — do not occur. The first way of working on this world is to skim the surface of the swamp, traveling in a hydroplane at high speed. The whole point is the speed, and the variety of ideas and experiences that come from just traveling about with no particular place to go. This is a mode of inner value, which we could call the artistic mode. Playing with this description a little further, we can see that this is hardly a safe way of operating within a swamp: it's all too easy to crash into some unexpected experience, to run out of fuel (inspiration? ), or to decide to settle down in some uncharted spot with no hope of future supplies or common experience shared with anyone else. But it's certainly the quickest way of scanning a wide range of experiences and points of view — although, at that speed, it's not going to be too easy to make sense of anything other than that they were, indeed, experiences and points of view. Another modus operandi seems quite the opposite of the artistic one: to develop one point of view as far as it will go, right out into another dimension. You state that that point of view is true — inviolably and absolutely true — and build on it, like a pole in the swamp. This is a mode of conviction, of faith, of inner truth — the mystical or religious mode. Again, playing with this image a little further, the higher you climb up the pole, the more of the swamp will come within your view: the more you climb, the more true will seem the point of view. In the distance you can see other poles, other points of view — some of them way out in the distance indeed - but you can hear that experiences from those poles, especially from further up each pole, seems much the same as your own. The mystics, those people who are well and truly up the pole and with their heads in the clouds, can see and share a vast range of vision — even though most of it seems like cloudy thinking to us. The only trouble with this mode is that you can't actually experience anything else, since, by its definition, you have to stay with that one point of view; and it seems a sad fact that each pole has to be counterbalanced by a vast morass of struggling bodies, each of whom has grasped the pole and disappeared beneath the surface, screaming “I have the truth” as they did so. A friend and I were once intercepted at the station by an evangelist wanting to give us “coffee and the word of God’. It was a predictable set-up, and the coffee was poor, too. The third mode in this model is to build a solid platform, a safe predictable area in which everything is true and inter-related in logic. Everything is patently obvious, there are no surprises on the platform itself — although around the edges things may not be quite so predictable as they seem. This is a world of outer truth, a scientific world. To many people on the platform, the platform itself defines reality, and encompasses the whole of truth. To this point of view, which we could call public-science or ‘scientism’, anything beyond the platform is unreal; their duty is to build higher and higher walls around the platform, to protect the good citizens from the ignorance and superstition beyond. In fact this has very little to do with science as practiced - we could suggest that these are same people who would have screamed “I have the truth” around the poles of religion, except that the solidity of the platform prevents them from decently disappearing beneath the surface as would have happened elsewhere. The platform is woven between a group of poles, more often called the ivory towers of academia; their mystics are the ‘pure scientists’ whose breadth of vision is matched only by the impenetrability of their thought. And at the edge of the platform are practical scientists, researchers working at the limits of the known world — having discovered, by some means or other, some unintended hole in the fortress walls of scientism. Scientists, says Leo, are like people in wheelchairs — they need firm level ground to move about on. To move, they must extend the platform, extending the boundaries of science, cutting down shady dogmas and filling in soggy hypotheses (to use Leo's graphic image). But when they arrive at some new place, it is just as boring and predictable as anywhere else on the platform - hobgoblins and foul fiends having rushed away at the sound of the first myth being exploded. For the problem with this mode of working is that, by the time it has finished, what it seeks has ceased to be the swamp, has ceased to be reality as it is (or was) — it is just an artificial platform, an ‘objective’ world with no room for personal experience at all. But working away at the edges of the platform are another group, commonly but quite wrongly called ‘applied scientists’. At one edge you'll find the psychiatrists, not bothering too much about which theory is absolutely true, but using ideas from Jung, Adler, Freud, Laing and anyone else's work they can lay their hands on. And at another edge there'll be electrical engineers switching between wave and particle theories of light and energy, blithely unconcerned about their mutual incompatibility in logic. At first this does look like science, but only because of the safety-line of ‘if it doesn't work, go back to theory’: in other words go back to ‘outer truth’. But in fact this is a quite different mode, in which you carry the platform with you, spreading your weight on swamp shoes to allow you to move with relative freedom from place to place, idea to idea, to find a point of view which is useful at that time, rather than supposedly ‘true’ in any absolute sense. This is a mode in which truth is defined in terms of whether it has practical value, outer value. We could describe this as a technological mode. But it has an easier label — a magical mode. Whilst there is a real structural difference between technology and science, there is no structural difference between technology and magic. It's entirely true that, as Arthur C. Clarke put it, ‘any sufficiently advanced technology is indistinguishable from magic”. But it's also true that “any sufficiently advanced magic is indistinguishable from technology”. They may seem different — sometimes very different — but the underlying approach to reality is exactly the same. The only difference between magic and technology, in practice, is that magicians tend to be a little way out in the distance — they may be seen wandering to astrology, alchemy and other forgotten, part-ruined areas of the old platforms of science, to rest by some religious pole, or travel as fools where angels fear to tread. This mode is hardly safe, as the platform of science may be, but at least it works on the swamp as it is; and the point of the exploring is not to find out how true a belief, a point of view, may be, but to put it to use. Your mind is a marvelous chunk of shivering gray matter, Mr. Cheevy. We humans as swamp things, that's great. My reality: Inside the castle, inside the heart, at the very center of every one of us we are both completely imminent yet also completely transcendent, in the swamp, at the top of the pole and everywhere inbetween. Mystics are no different than anyone else.. It's a paradox we struggle with every single day. I loved that band the Meat Puppets, mostly because of their perfect name.